Broxhead estate was purchased in 1902. Broxhead House was built by Admiral Foley in 1877. The Foleys were a Worcestershire family who had made their fortune in iron and coal, and the head of the family was ennobled as Lord Foley. The arms of Foley, which were on the house, now demolished, can still be seen on the arches at the side of the new laboratories. Some of the land was used for the building of Louisburg Barracks and stables for the Royal Field Artillery. By 1915 the stables were said to have housed two to three thousand horses and mules. Situated on the other side of Station Road and aligned at right angles to it, were five blocks of married quarters. Four of the blocks accommodated 21 families and the fifth 19 families. Each block was given a name, taking the letters of the alphabet in turn. The naming started with these blocks and they were known as Atherton, Belvoir, Cottismore, Dartmoor and Exmoor. The naming then continued round into the married quarters of Budds Lane. Until the outbreak of the 1939 -1945 war Broxhead House was the residence of the General Officer Commanding and later the Brigade Commander. 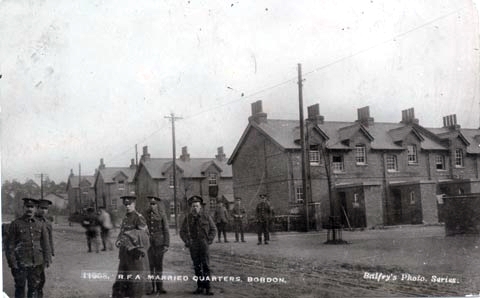 It then became the Headquarters of the newly created Bordon and Longmoor Sub-Area (formed from HQ Bordon Garrison) until the latter moved to Batts Hall, Frensham in November 1940. The Canadians then took over the house and for the remainder of the war used it as their Headquarters. After the departure of the Canadians, the building was first used as a medical reception station and from November 1950 to January 1952 as a hotel for officers, but this was not a success. It then became the Headquarters of the Army Emergency Reserve REME, later Central Volunteer Headquarters REME, until they moved into Louisburg Barracks in 1979. 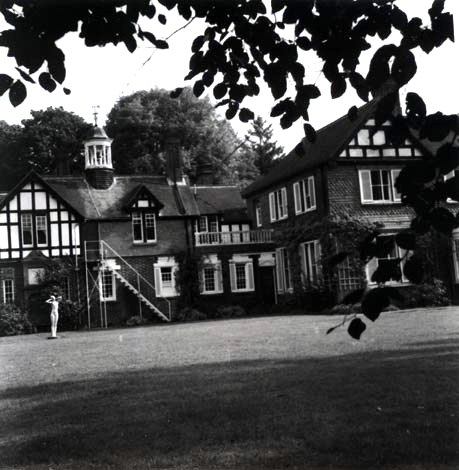 Wolfe Lodge was sold off in 1981, closely followed by Broxhead House itself to Molex. The latter was mostly demolished in 1983 so that only one turret and a few of the arches remain, laboratories being built on the rest of the house site. It is now named Lion Court.